THE FASTEST 100K ON GRAVEL! No license required. The Texas Chainring Massacre is a full on gravel grinder featuring a unique combination of dirt roads and desolate country roads that promises to be both scenic and challenging. Riders will be able to enjoy a fantastic route that starts and ends in the “civilized” part of the D/FW Metroplex near Valley View, TX while meandering through some scenic rural areas. 100K Dash For the Cash – This marked course ride will provide neutral aid/support station at approximately the half way point but no outside support is allowed except at the aid station. Plan to bring enough food and supplies to be self supported in case of break down since it might take several hours for a sweep/sag vehicle to reach stranded riders. Cash payout 3 deep and Series Points awarded. All roads whether paved or unpaved are public roads subject to the regulations of the great State of Texas. Participants are required to obey all “rules of the road” and laws for the applicable jurisdiction(s) in which they operate their bicycles and/or other vehicles. This applies to both the featured event as well as any practice or warm up events. 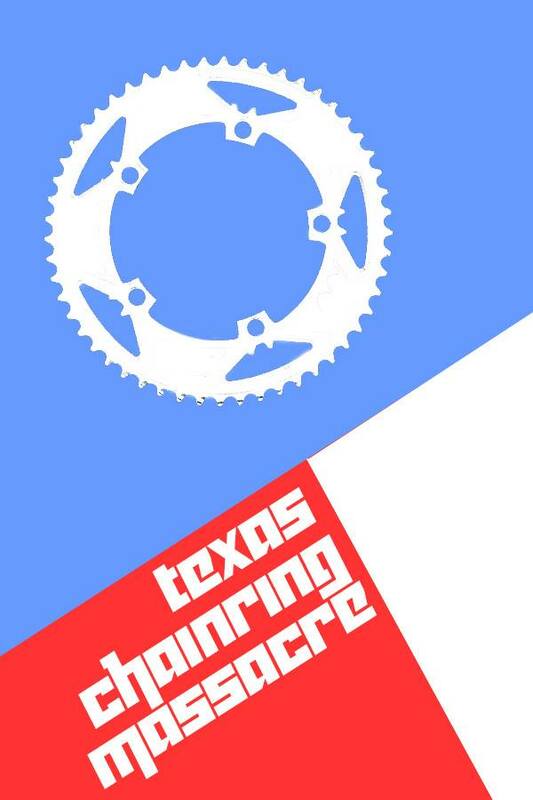 The Texas Chainring Massacre is an all-weather event unless conditions are deemed unsafe for riders so there is a no refunds policy. Promoter may modify the course at any time for rider safety or based on course conditions. 100 Mile Open – The classic long distance gravel grinder. This will be a marked course with neutral support at least every 33 miles. Cash payout 3 deep and Series Points awarded. 100K Category races by age/discipline. Awards 3 deep, no cash payout. Non Competitive Fun Ride – Multiple distance options for everyone from the complete beginner to the all day wanderers. Ideal for those newer to gravel grinding and/or those who want some bonus time hanging out in Valley View and the Whiskey Hollow Distillery. Hosts and Sponsors – More info soon but the town of Valley View and Whiskey Hollow Distillery will be going above and beyond to roll out the red carpet for us so stay tuned for details!